Now is the time to witness at first hand the mystery of Tibet - as modern life begins to encroach on this once forbidden land. Biking starts from serene Lhasa, with its wide streets, encircling mountains and sense of living religion manifestly woven into everyday life through centuries of devotion. We ride through picturesque valleys and camp wherever scenic locations and access to water happily coincide. This is not technical biking, but the trip demands a high level of fitness if you want to ride the whole route - something very few other companies offer. The rewards are incomparable views of Everest and the Nepal Himalaya. The endless descent into verdant Nepal offers an incredible contrast to the arid Tibetan Plateau. If you've got the legs we've got the trip – it won't disappoint! Biking in the highland can be classed as among the most challenging rides for a bicyclist. This is for many reasons including altitude, distance, weather, road conditions and even life style change. The ride through the highland is the highest altitude mountain biking in the world for a sustained period. Your bike may be your companion as you tour through the mountainsides, enjoying the serenity and quiet of the wilderness. 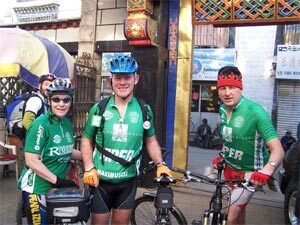 Or your bike may be your transport from one historical site to another within Lhasa. Above, you will find links to detailed itineraries of each of the tours that we offer.